akolonin: Technological singularity - about genes, not bytes? 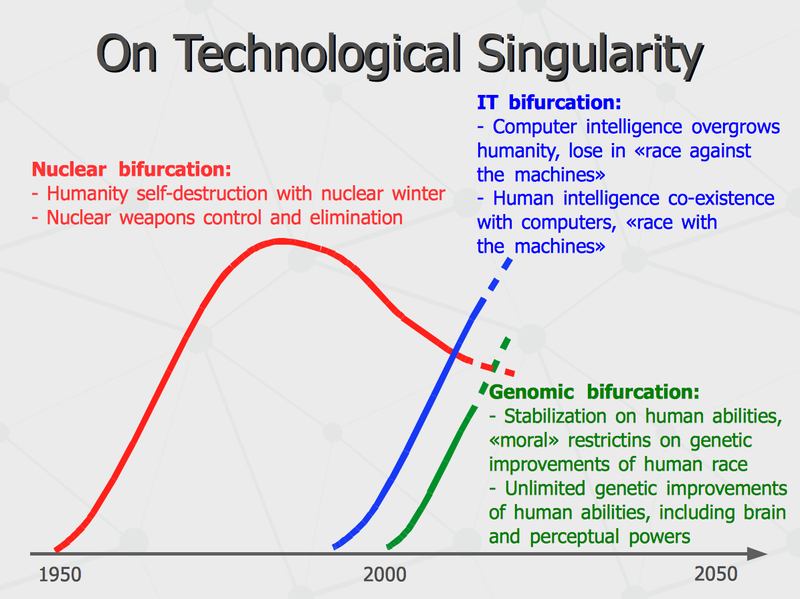 Technological singularity - about genes, not bytes? There are talks about the technological singularity enforced by development of computational intelligence. However, there are few overlapping singularities having place at this time. The first one started with nuclear era which put the whole humanity onto bifurcation point between self-destruction in nuclear winter and keeping to survive in strategic equilibrium between multiple owners of nuclear weapons. We all are still balancing on this edge. The second kind of singularity wave have been raised sharply on the border of two last centuries, with burst of the internet, search engines and social networks, and its growth is predicted the whole world to change irreversibly in couple ten years. When this happens, another option will be about whether humanity loses the evolutionary war in favor of "The Matrix" or it customizes itself to "race with the machines".